With Amazon RDS, you can copy automated or manual DB snapshots. After you copy a snapshot, the copy is a manual snapshot. Copying an automated snapshot to another AWS account is a two-step process: You first create a manual snapshot from the automated snapshot, and then you copy the manual snapshot to the other account. You can't copy a snapshot to or from the following AWS Regions: China (Beijing) or China (Ningxia). You can copy a snapshot between AWS GovCloud (US-East) and AWS GovCloud (US-West), but you can't copy a snapshot between these AWS GovCloud (US) regions and other AWS Regions. If you delete a source snapshot before the target snapshot becomes available, the snapshot copy may fail. Verify that the target snapshot has a status of AVAILABLE before you delete a source snapshot. You can have up to five snapshot copy requests in progress to a single destination region per account. Depending on the regions involved and the amount of data to be copied, a cross-region snapshot copy can take hours to complete. If there is a large number of cross-region snapshot copy requests from a given source AWS Region, Amazon RDS might put new cross-region copy requests from that source AWS Region into a queue until some in-progress copies complete. No progress information is displayed about copy requests while they are in the queue. Progress information is displayed when the copy starts. Amazon RDS deletes automated snapshots at the end of their retention period, when you disable automated snapshots for a DB instance, or when you delete a DB instance. If you want to keep an automated snapshot for a longer period, copy it to create a manual snapshot, which is retained until you delete it. Amazon RDS storage costs might apply to manual snapshots if they exceed your default storage space. For more information about backup storage costs, see Amazon RDS Pricing. You can copy snapshots shared to you by other AWS accounts. If you are copying an encrypted snapshot that has been shared from another AWS account, you must have access to the KMS encryption key that was used to encrypt the snapshot. You can copy a shared DB snapshot across regions, provided that the snapshot is unencrypted. However, if the shared DB snapshot is encrypted, you can only copy it in the same AWS Region. You can copy a snapshot that has been encrypted using an AWS KMS encryption key. If you copy an encrypted snapshot, the copy of the snapshot must also be encrypted. If you copy an encrypted snapshot within the same AWS Region, you can encrypt the copy with the same KMS encryption key as the original snapshot, or you can specify a different KMS encryption key. If you copy an encrypted snapshot across regions, you can't use the same KMS encryption key for the copy as used for the source snapshot, because KMS keys are region-specific. Instead, you must specify a KMS key valid in the destination AWS Region. You can also encrypt a copy of an unencrypted snapshot. This way, you can quickly add encryption to a previously unencrypted DB instance. That is, you can create a snapshot of your DB instance when you are ready to encrypt it, and then create a copy of that snapshot and specify a KMS encryption key to encrypt that snapshot copy. You can then restore an encrypted DB instance from the encrypted snapshot. When you copy a snapshot to an AWS Region that is different from the source snapshot's AWS Region, the first copy is a full snapshot copy, even if you copy an incremental snapshot. A full snapshot copy contains all of the data and metadata required to restore the DB instance. After the first snapshot copy, you can copy incremental snapshots of the same DB instance to the same destination region within the same AWS account. An incremental snapshot contains only the data that has changed after the most recent snapshot of the same DB instance. Incremental snapshot copying is faster and results in lower storage costs than full snapshot copying. Incremental snapshot copying across AWS Regions is supported for both unencrypted and encrypted snapshots. Copying incremental snapshots across multiple AWS accounts is not supported. If you set up snapshot copies from one AWS account to another AWS account, all of the copies are full snapshots, even within the same region. Depending on the AWS Regions involved and the amount of data to be copied, a cross-region snapshot copy can take hours to complete. In some cases, there might be a large number of cross-region snapshot copy requests from a given source AWS Region. In these cases, Amazon RDS might put new cross-region copy requests from that source AWS Region into a queue until some in-progress copies complete. No progress information is displayed about copy requests while they are in the queue. Progress information is displayed when the copy starts. When you copy a source snapshot that is a snapshot copy, the copy isn't incremental because the snapshot copy doesn't include the required metadata for incremental copies. Option groups are specific to the AWS Region that they are created in, and you can't use an option group from one AWS Region in another AWS Region. When you copy a snapshot across regions, you can specify a new option group for the snapshot. We recommend that you prepare the new option group before you copy the snapshot. In the destination AWS Region, create an option group with the same settings as the original DB instance . If one already exists in the new AWS Region, you can use that one. In the destination AWS Region, create an option group with the same settings as the original DB instance . If one already exists in the new AWS Region, you can use that one. After you restore the snapshot in the destination AWS Region, modify the new DB instance and add the new or existing option group from the previous step. In the destination AWS Region, create a DB parameter group with the same settings as the original DB instance . If one already exists in the new AWS Region, you can use that one. After you restore the snapshot in the destination AWS Region, modify the new DB instance and add the new or existing parameter group from the previous step. For each AWS account, you can copy up to five DB snapshots at a time from one AWS Region to another. If you copy a DB snapshot to another AWS Region, you create a manual DB snapshot that is retained in that AWS Region. Copying a DB snapshot out of the source AWS Region incurs Amazon RDS data transfer charges. For more information about data transfer pricing, see Amazon RDS Pricing. After the DB snapshot copy has been created in the new AWS Region, the DB snapshot copy behaves the same as all other DB snapshots in that AWS Region. You can copy a DB snapshot using the AWS Management Console, the AWS CLI, or the RDS API. This procedure copies an encrypted or unencrypted DB snapshot, in the same AWS Region or across regions, by using the AWS Management Console. Select the DB snapshot that you want to copy. For Actions, choose Copy Snapshot. The Make Copy of DB Snapshot page appears. 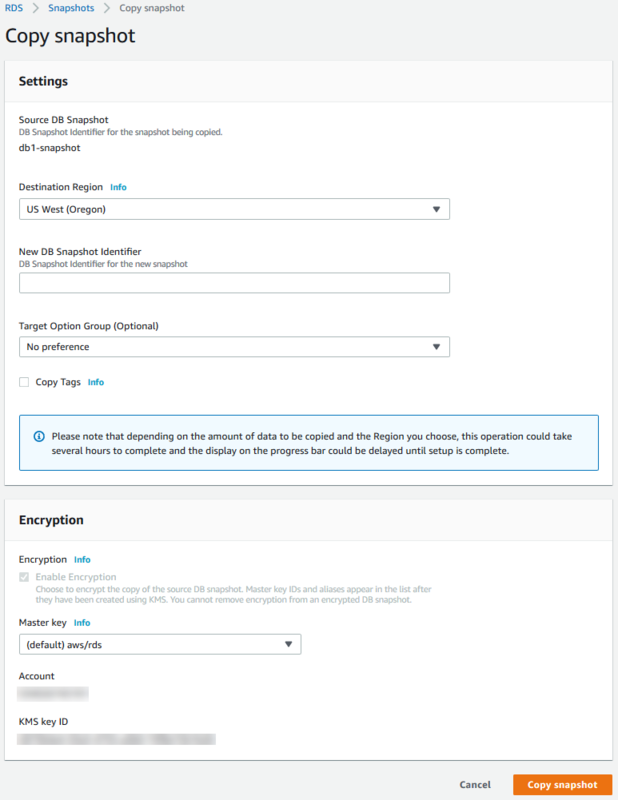 (Optional) To copy the DB snapshot to a different AWS Region, for Destination Region, choose the new AWS Region. The destination AWS Region must have the same database engine version available as the source AWS Region. For New DB Snapshot Identifier, type the name of the DB snapshot copy. (Optional) For Target Option Group, choose a new option group. Specify this option if you are copying a snapshot from one AWS Region to another, and your DB instance uses a non-default option group. If your source DB instance uses Transparent Data Encryption for Oracle or Microsoft SQL Server, you must specify this option when copying across regions. For more information, see Option Group Considerations. (Optional) Select Copy Tags to copy tags and values from the snapshot to the copy of the snapshot. Choose Disable encryption if the DB snapshot isn't encrypted and you don't want to encrypt the copy. Choose Enable encryption if the DB snapshot isn't encrypted but you want to encrypt the copy. In this case, for Master Key, specify the KMS key identifier to use to encrypt the DB snapshot copy. Choose Enable encryption if the DB snapshot is encrypted. In this case, you must encrypt the copy, so Yes is already selected. For Master Key, specify the KMS key identifier to use to encrypt the DB snapshot copy. You can copy a DB snapshot by using the AWS CLI command copy-db-snapshot. If you are copying the snapshot to a new AWS Region, run the command in the new AWS Region. The following options are used to copy a DB snapshot. Not all options are required for all scenarios. Use the descriptions and the examples that follow to determine which options to use. --source-db-snapshot-identifier – The identifier for the source DB snapshot. If the source snapshot is in the same AWS Region as the copy, specify a valid DB snapshot identifier. For example, rds:mysql-instance1-snapshot-20130805. If the source snapshot is in a different AWS Region than the copy, specify a valid DB snapshot ARN. For example, arn:aws:rds:us-west-2:123456789012:snapshot:mysql-instance1-snapshot-20130805. --target-db-snapshot-identifier – The identifier for the new copy of the encrypted DB snapshot. --copy-tags – Include the copy tags option to copy tags and values from the snapshot to the copy of the snapshot. --option-group-name – The option group to associate with the copy of the snapshot. --kms-key-id – The AWS KMS key ID for an encrypted DB snapshot. The KMS key ID is the Amazon Resource Name (ARN), KMS key identifier, or the KMS key alias for the KMS encryption key. If you copy an encrypted snapshot to a different AWS Region, then you must specify a KMS key for the destination AWS Region. KMS encryption keys are specific to the AWS Region that they are created in, and you cannot use encryption keys from one AWS Region in another AWS Region. --source-region – The ID of the AWS Region of the source DB snapshot. If you copy an encrypted snapshot to a different AWS Region, then you must specify this option. The following code creates a copy of a snapshot, with the new name mydbsnapshotcopy, in the same AWS Region as the source snapshot. When the copy is made, all tags on the original snapshot are copied to the snapshot copy. The following code creates a copy of a snapshot, with the new name mydbsnapshotcopy, in the AWS Region in which the command is run. The following code example copies an encrypted DB snapshot from the us-west-2 region in the us-east-1 region. Run the command in the us-east-1 region. You can copy a DB snapshot by using the Amazon RDS API action CopyDBSnapshot. If you are copying the snapshot to a new AWS Region, perform the action in the new AWS Region. The following parameters are used to copy a DB snapshot. Not all parameters are required for all scenarios. Use the descriptions and the examples that follow to determine which parameters to use. SourceDBSnapshotIdentifier – The identifier for the source DB snapshot. TargetDBSnapshotIdentifier – The identifier for the new copy of the encrypted DB snapshot. CopyTags – Set this parameter to true to copy tags and values from the snapshot to the copy of the snapshot. The default is false. OptionGroupName – The option group to associate with the copy of the snapshot. Specify this parameter if you are copying a snapshot from one AWS Region to another, and your DB instance uses a non-default option group. If your source DB instance uses Transparent Data Encryption for Oracle or Microsoft SQL Server, you must specify this parameter when copying across regions. For more information, see Option Group Considerations. KmsKeyId – The AWS KMS key ID for an encrypted DB snapshot. The KMS key ID is the Amazon Resource Name (ARN), KMS key identifier, or the KMS key alias for the KMS encryption key. PreSignedUrl – The URL that contains a Signature Version 4 signed request for the CopyDBSnapshot API action in the source AWS Region that contains the source DB snapshot to copy. You must specify this parameter when you copy an encrypted DB snapshot from another AWS Region by using the Amazon RDS API. You can specify the source region option instead of this parameter when you copy an encrypted DB snapshot from another AWS Region by using the AWS CLI. DestinationRegion - The AWS Region that the encrypted DB snapshot will be copied to. This AWS Region is the same one where the CopyDBSnapshot action is called that contains this presigned URL. For example, if you copy an encrypted DB snapshot from the us-west-2 region to the us-east-1 region, then you call the CopyDBSnapshot action in the us-east-1 region and provide a presigned URL that contains a call to the CopyDBSnapshot action in the us-west-2 region. For this example, the DestinationRegion in the presigned URL must be set to the us-east-1 region. KmsKeyId - The KMS key identifier for the key to use to encrypt the copy of the DB snapshot in the destination AWS Region. This is the same identifier for both the CopyDBSnapshot action that is called in the destination AWS Region, and the action contained in the presigned URL. SourceDBSnapshotIdentifier - The DB snapshot identifier for the encrypted snapshot to be copied. This identifier must be in the Amazon Resource Name (ARN) format for the source AWS Region. For example, if you are copying an encrypted DB snapshot from the us-west-2 region, then your SourceDBSnapshotIdentifier looks like the following example: arn:aws:rds:us-west-2:123456789012:snapshot:mysql-instance1-snapshot-20161115. The following code creates a copy of a snapshot, with the new name mydbsnapshotcopy, in the us-west-1 region. The following code creates a copy of a snapshot, with the new name mydbsnapshotcopy, in the us-east-1 region.